This has all the trademarks of a Film Noir in this neo-noir murder mystery. It’s thick with plot, wonderful acting, and a tight direction that gives a solid storybook execution that leads the viewer into this 1948 thriller set in Los Angeles. When going into a neo-film noir, meaning a modern movie using new elements, but set in the time period of film making know as Film Noir. Sadly something that I see happening this day and age, in this modern movie generation, is they have no idea what film noir is. I find myself having to explain this style of film making more and more often. So for you all reading this that don’t know what film noir is, Film Noir is basically describing a crime drama. Most of these where high on doses of attitudes that mainly consisted of a bleak representation of people. Also doses of sexual undertones. Film Noir had a style of low light, visual black and white, and compositions that are unbalanced in imagery. There is a huge visual reality to film noir. In most movie circles this style is prominent, from the years 1940 and into 50’s. Usually there is a private eye, or a police officer who dresses in plain clothes. Sometimes they consisted of average people brought into an element of crime. An ageing individual. People who followed the law, but ends up, smack in the middle of some criminal reality. Other times, a helpless victim. Most always a damsel in distress, or a Vixen, and Black Widow. The originals where always in black and white, color came later, but the majority of the originals are considered by most, from the 40’s to 50’s. Film Noirs have been made throughout the years, bleeding the classic doses of nostalgia and originality. Now there is a huge debate, angry conversations, and downright bickering by fans of this style. Some are set in their ways, and only accept certain films, and definitions of what classifies as a film noir. It’s almost like Star Wars and Star Trek fans in this style of fandom. So getting back to the point which is the review of this neo-noir, meaning a modern day film noir. A movie that has the elements of a classic film noir that uses modern elements, technology, and so on. Devil in a Blue Dress is that prime example of Neo-noir film. It has all the trademarks of a classic Film Noir. This is in color, but you still get that unbalanced filming, and darkened shadowed moments by playing with lighting. This stars one of the greatest living actors, Denzel Washington. A truly gifted and prominent personality in crafted excellence in film. He has grown over the years as a force in Hollywood. Even his lesser examples of films, he shines, just the same as if he was a part of some huge budget film. No matter what he plays in, I am fascinated, and never bored. Washington plays Ezekiel “Easy” Rawlins. He is a veteran from World War 2. The time period is 1948. He was laid off from work as an aircraft manufacturer. To make ends meet he becomes a private investigator. He has no training in this job description, but goes about the process. Now something that needs to be mentioned is the automatic narrative to begin the film. Noirs would usually have narration in spots, or at the opening of the film, where your main character, would open the story. In this film the movie begins with Easy Rawlins stating: "A man once told me that when you step out of your door in the morning, you're already in trouble. The only question is, are you on top of that trouble or not?" Easy’s friend Joppy introduces DeWitt Albright to Easy. DeWitt is looking for a particular white woman named Daphne Monet who is missing. Easy learns that Daphne is the girlfriend to a rich man named Todd Carter. Easy is offered 100 dollars to find Daphne. Soon the spiraling plot leads Easy into a world of crime, gangsters, and all the trademarks you would expect in film noir. DeWitt is played by Tom Sizemore. I am not a huge fan of Sizemore, but his character in this works. Daphne is played by the beautiful Jennifer Beals. Todd Carter is played by Terry Kinney. The whole cast is a wonderful flowing film of expertise in the art of performing in film. Washington is as dynamic in this film as all his others. He creates, and treats the viewer to a memorable character that slowly grows on you. Something to keep an eye out for, is the character of Moose Alexander, who is played by the amazing actor Don Cheadle. Both Cheadle, and Washington are perfection. I have to say 100 percent that Cheadle own's his part, and his character is the best part of the film. Also the fantastic Maury Alan Chaykin stars in Devil in the Blue Dress. I have been a huge fan of his work my whole life. He was one of those actors that deserved all the accolades he could get. It’s so sad that he passed away in 2010 at the young age of 61. This was written and directed by Carl Franklin. This is based on the book by the same name, written by author Walter Mosley. Franklin throughout his career has been an actor, writer, director, and producer. He has captured some interesting films under his belts. He directed the 1992 thriller One False Movie, which was co-written by actor, director Billy Bob Thornton. He directed the wonderful drama, 1998’s One True Thing. He also joined again with Washington for the 2003 film, Out of Time. He has also directed a lot of television, including, House of Cards, Homeland, The Affair. He has a unique style of direction that focuses on the actors, and the execution of the storyline which can be seen in the filming of Devil in a Blue Dress. Now on a side note if you have never read any of Walter Ellis Mosley’s books, then I plead that you do so. He is a fantastic writer that gives pure entertainment through his imagination. And that’s where the reality is all the better, is if you like the character of, Easy Rawlins you can continue his mystery adventures, because Mosley has written a series of books using this character. 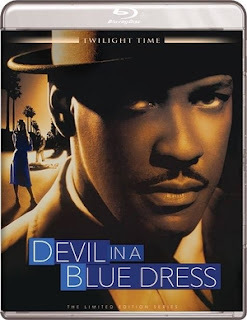 Devil in a Blue Dress is a film not for everyone, but for those lovers of Film Noir, good acting, and a mysterious plot, then I feel it’s a must. Twilight Time did a fantastic job at bringing this film to a new generation, on a lovingly new outlet to experience it. I still own my VHS copy and DVD. So I was happy this was coming to Blu-ray so I could see it in a new fresh way. Twilight Time did a great job in transferring this. The colors are vibrant and crisp, right along with the audio. The wonderful way this movie is filmed in darkened tones, yet with color comes off in a unique visual reality. The transfer to blu-ray show cases that unique classic Film Noir lightning in great detail. Fantastic in the audio and video. Isolated Score Track. This is another example of a golden ticket for Twilight Time special features. I am a huge music lover, and something I love is music scores, and that is why I look forward to this special feature. The man behind the music score is a genius of talent Elmer Bernstein. Anyone who is a movie lover should know his tunes. From hundreds, upon hundreds of films and TV. He has given his talent. From the great movies like The Magnificent Seven, To Kill a Mocking Bird, Ghostbusters, The Ten Commandments, The Man with the Golden Arm, The Great Escape, just to name a few. Over 50 years he supplied the beauty of ear candy. Also he was nominated for an amazing 14 Academy Awards. His music is still being used today on soundtracks. His legend lives on. Twilight Time honored this music master with this special feature, that is a must listen. He had many styles of music in composing, to Jazz, and so much more. A true mastery that shall never be forgotten. Sadly he is no longer with us, but his music lives, and this special features showcases that. Audio Commentary with Writer-Director Carl Franklin. A great listen. Hearing Franklin talk about the film, is a must listen, to any fan of this film. Very informative. Don Cheadle Screen Test. This was great. Cheadle’s performance in this film is the golden ticket of character and acting. I think he deserved an award. Truly a shining moment in cinema that sadly has been overlooked. Another wonderful Blu-ray product by Twilight Time. A 90’s film, using a classic reality for its execution. A modern day Film Noir, with excellent acting. Twilight Time did another lovely job, and created a product that deserves to be bought, owned, and watched. Some good extra feature, and a solid example of a beautiful HD transfer.